From the snow-capped mountains of Gulmarg to the shimmering waters of the Dal Lake in Srinagar, Jammu and Kashmir is a state of contrasts. Whilst it has seen some turbulent times in the past and it is worth keeping an eye on the local situation before travelling, today it is widely considered a safe and indeed idyllic travel destination. Our pick of the best places to stay in Jammu and Kashmir include a wide range from houseboats to Mughal palaces. Skiing mecca in winter, hikers' paradise in summer; depending on what you are after there is something to do in Gulmarg all year round. It is a popular shooting location for Bollywood movies thanks to some stunning scener. This has increased its popularity as a holiday destination in recent years, and today there are some excellent hotels to choose from. Head up to Mount Afarwat, by foot, pony or more conveniently gondola. From 3747m enjoy far reaching views across to Pakistan’s Nanga Parbat on a clear day. The most convenient accommodation for skiing is located closer to the gondola entrance. If visiting in the summer months then hiking is what you are here for. Trek through meadows and thick pine forest, with the local birds’ song to cheer you on. From intermediate treks into the Pir Panjal Mountains to popular day hikes to Khilanmarg and Alpathar Lake. For equine enthusiasts or if walking is just not your thing then pony trekking is popular here also. There are plenty of unique ways to experience Gulmarg’s beauty. Gulmarg’s nearest airport is in Srinigar, just 56km and a wonderfully scenic drive away. Overlooked by the majestic Zabarwan Mountains in the distance, Srinagar is the largest city in Jammu and Kashmir and a former summer capital. 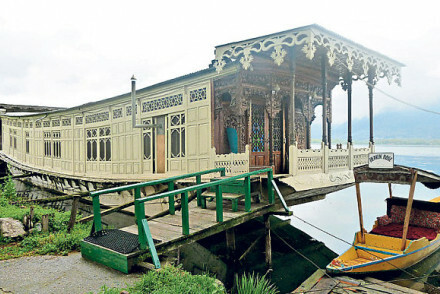 Famed for its mesmerizingly placid Dal Lake, on which a flurry of life orbits, it is awash with colourful houseboats and floating markets bob along its waters.It is along these waters that George Harrison learned to play the sitar taught by the legend, Ravi Shankar. This long, still lake runs between the city centre right through to the old city of Srinagar to the northwest. The lake itself is surrounded by the centuries-old Mughal Gardens: Chesmashahi, Nishat and Shalimar. Representing the emperor's responsible for commissioning them ideas of paradise they feature manicured gardens, a splash of colour from brimming flower boxes and sonorous fountains. Make sure not to miss the lesser known Nigeen Lake, located to the west of the Dal Lake, connected by a narrow straight. Overlooked by the Hari Prabat range and surrounded by poplars and willows it is a wonderfully peaceful visit. Best visited in the summer months when the average temperature is in the balmy low twenties. It is beautiful in winter, under a blanket of snow, however be wary if booking budget options as not everywhere has hot water! Book early to avoid disappointment. In Jammu and Kashmir's Eastern reaches you'll find Ladakh (and the lively gateway to the region, Leh) another haven for trekkers and adrenaline junkies - there's some serious white water rafting to be had here! It's pretty much a summer or spring only destination, as many of the village are completely inaccessible during the winter months. Just don't forget to acclimatization first if you're planning a trek. With altitudes of 10000m and more, it's not somewhere for the faint-hearted! 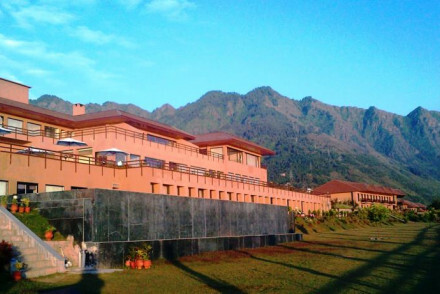 The Hotel Guru's selection of the best places to stay in Jammu and Kashmir is wide ranging: from houseboats to homestays there are plenty of great places to stay. Excellent value for money, Mahatta Home Stay’s rooms are simple but very homely, decorated in traditional Kashmiri textiles. Located in a peaceful area it is surrounded by a garden abrim with flowers. A warm welcome to Srinigar. The Kaal provides a simple yet homely stay in Leh. Wooden panelled rooms open onto balconies or a terrace, but bathrooms are basic. Ashan Mount Resort is Kashmir's first glamping retreat. Come here for astonishingly beautiful surroundings and wonderful outdoor activities, plus top notch accommodation equipped with such luxuries as heated mattresses and thick duvets! 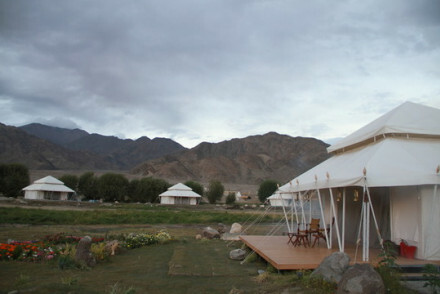 The Chamba Camp offers superlative luxury in remote Ladakh. Tents boast four poster beds, chandeliers and fabulous bathrooms. All this and gourmet food too! 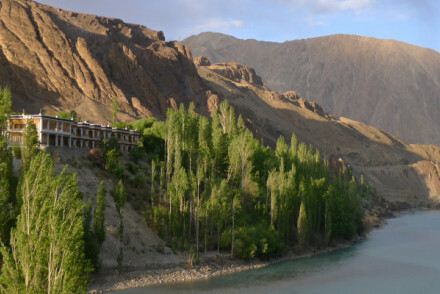 The Apricot Tree is a true escape in a stunning location overlooking the river Indus. Perfect for anyone who loves the great outdoors and wants a real taste of the region. The quintessential way to travel in Srinagar! If you want a night on the water, these are the best of the best. Gomang Boutique Hotel in Leh appears traditional on the outside, but inside you'll discover chic contemporary interiors and modern bathrooms. Also in Leh, The Grand Dragon has light, bright modern rooms and a lovely garden. With stunning views and great food, it's an easy choice! Located at an elevation of 1730 feet above town, without contest Vivanta by Taj – Dal View enjoys the best views of the Dal Lake. In addition it has an excellent spa and two fine dining options plus the five star service one would expect from this global chain. Putting Gulmarg very much on the luxury tourist map Khyber Himalayan Resort and Spa has everything you might want after an exertive day on the slopes: fine dining, indulgent spa and fabulous rooms to retire to. Built in 1910 The Lalit Grand Palace was a former residence of the Kashmiri royal family. Rooms are decorated in a classic style, with Kashmiri rugs and furnishing, not ostentatious. 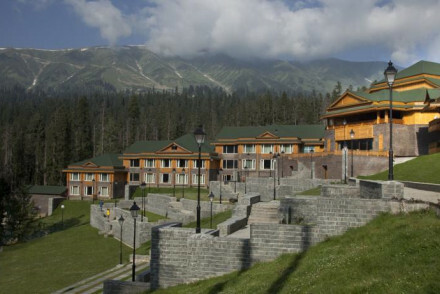 As much a part of Gulmarg as the gondola itself is Hotel Highlands Park. Run by the Nedou family for decades it provides a comfortable and quirky stay amidst beautiful interiors and gardens. 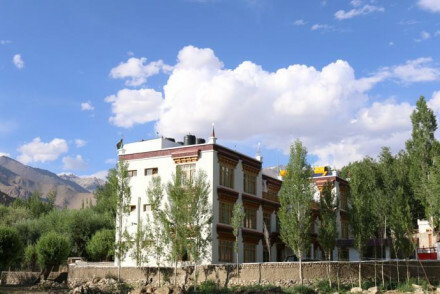 Nimmu House is a traditional Ladakhi stately home where you can either choose rooms in the house or tented accommodation for the more adventurous. Still not sure which to book? From heritage to luxury browse through our list of the best places to stay in Jammu and Kashmir to start to plan your trip. Or contact one of our friendly gurus for advice. A quaint haven of verdant lawns, paved pathways and flowerbeds bursting with roses, situated in the heart of Srinagar. Rooms are clean and comfortable, but the welcome and hospitality are second to none. 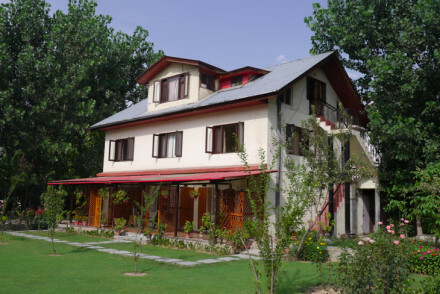 Come here for a real home from home experience and to soak up genuine Srinagar. The Kaal provides a simple, yet homely stay in Leh. Rooms have wood panelling, living areas and large windows, typical of the region, which open up onto terraces or private balconies. Bathrooms are basic. There is a pleasant sunny garden and restaurant serving local dishes - momos are a speciality! Local markets - Leh market is just a short walk away and specialises cashmere shawls and traditional Ladakhi artwork and jewellery. 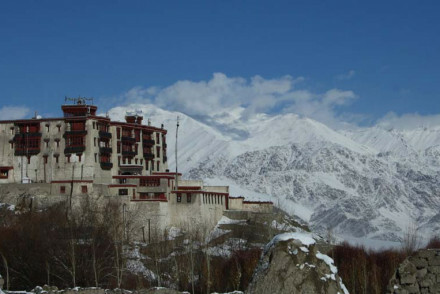 Sights nearby - Ladakh Palace, Shanti stupa and Sunset Point are all within easy reach. Whilst the interiors could do with a some updating, the picturesque setting, right beside the Nigeen Lake (much less frequented than Dal Lake), more than makes up for this. The gardens are filled with roses and tulips and plenty of nooks to relax with a good book. Rooms are large and wood panelled. 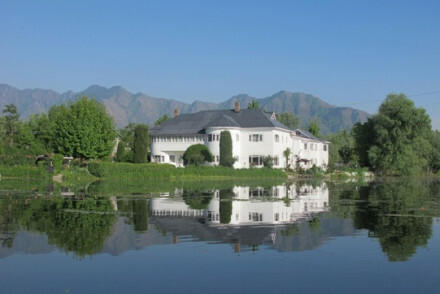 Back to Nature - Located on the banks of the Nigeen Lake this hotel enjoys a quiter spot of Srinagar. Great walks - Take a tour of the historic sites of town with your private guide. Birdwatching - The lakes of Srinagar attract an abundance of birdlife. Sailing - Take a boat out for sightseeing on the lake. From the approach Gomang is your typical Ladakhi hotel, complete with intricate wood carving. Step inside and it is a stylish, boutique offering. Rooms feature hardwood flooring, beds with leather headboards and colourful scatter cushions. Bathrooms are clean and modern. And there's a sunny garden! In the most outstanding location, overlooking the flowing River Indus, Apricot Tree is a true escape. With intricate woodwork and ornate, colourful Buddhist paintings there is even a traditional Ladakhi kitchen where meals can be enjoyed. Rooms are large and bright and feature private balconies. Back to Nature - Overlooking the River Indus with the Ladakh mountain range as its backdrop this property is surrounded by nature. Sights nearby - Alchi and Lamayuru monastries are within easy reach. 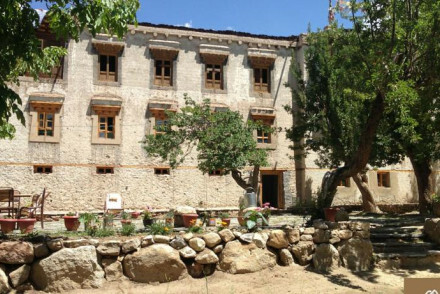 Housed in a traditional Ladakhi stately home this property provides a choice between tented accommodation or rooms in the house. All are effortlessly chic combining modern muted palettes and traditional Ladakhi fabrics and textiles. The food is superb, both French and Ladakhi and all included. Hideaway - Hidden in the picturesque village of Nimmu, yet still within easy reach of Ladakh's sights, it is a perfect hideaway. Birdwatching - Ladakh is home to an impressive variety of bird life. Best spotted on the banks of the Indus in the early morning. Great walks - There are plenty of scenic strolls leading directly from the property. Sights nearby - The monastries of Alchi and Likir are a day trip away. Sukoon is the first amongst equals on the Dal Lake. A comparatively new property they employ green credentials making it a stylish and sustainable stay. Intricately carved Kashmiri woodwork covers the walls and rooms feature bright pop colours, plus luxury bathrooms. There is a rooftop restaurant. Sights nearby - One of the most impressive examples of Kashmiri architecture the Khanqah Shah-i-Hamadan is a must visit. Birdwatching - The Dal Lake attracts a most varied variety of birdlife. Wake up in the early mornings to spot them. Local markets - The floating markets of the Dal Lake are quite spectacular. Great walks - Up to the Shankaracharya Hill viewing point. Comprised of 15 traditional yet modern Ladakhi cottages, all with stunning mountain views. 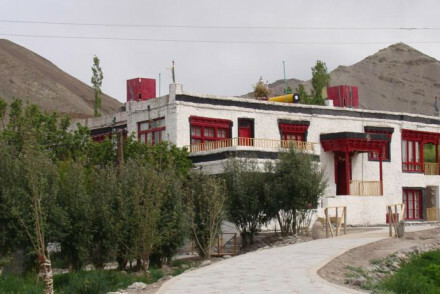 There is a restaurant serving Indian, Ladakhi and Tibetan dishes. Dining under the stars, next to the bonfire proves very popular. A perfect location for exploring the Ladakh valley. Great walks - There are some picturesque walking trails around Saboo leading directly from the property. 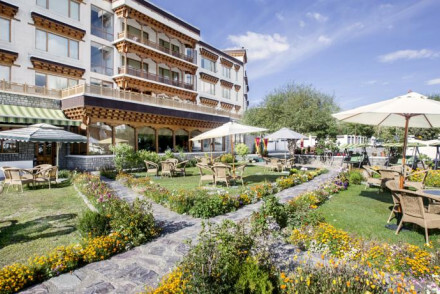 Back to Nature - Ensconced by the Ladakh range of mountains you are surrounded by nature. Local markets - Head into Leh town and pick up some souvenirs at the Tibetan market. Sights nearby - Nearby Shey Palace is well worth a visit. Within walking distance of town, everyone in Leh knows The Grand Dragon. Enjoying views across the Ladakh mountain range and River Indus, Taste of Dragon Restaurant serves Indian, Kashmiri, Chinese and Continental dishes. 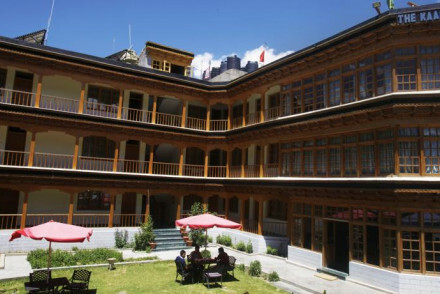 The hotel is decorated in a modern style with traditional Ladakhi trimmings. Local exploring - The Grand Dragon is ideally placed for exploring the sights of Leh as well as monastries and countryside further afield. Trekking - Ladakh is a trekkers paradise from day, to several week, long treks. Sights nearby - Shanti stupa, Leh Palace and Sunset Point are all within easy reach. Local markets - Leh market is awash with cashmere, silver jewellery and handicrafts. Chic interiors encapsulated in a traditional Ladakhi abode. With plenty of tailor-made packages from family to romance and wellness, there is something for everyone. 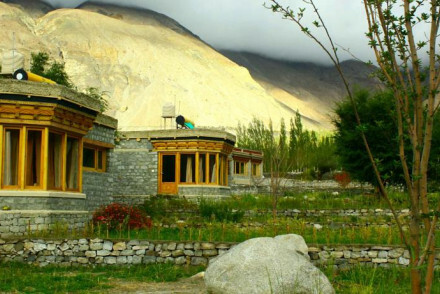 Located in the idyllic Nubra valley with views across the river, it is a stunning spot. Local, Indian and European dishes are served. Kashmir’s first glamping escape is the best place to stay in Sonamarg by a mile. Set on the River Sindh, in a region of astonishing natural beauty. Remote and magical. Charming traditional Ladakhi property, with authentic kitchen and dining experience, located in the beautiful village of Stok. Rooms are a blend of traditional features: bamboo ceilings and wood panelled windows with modern pop colours. Nestled in a leafy private garden it is a relaxing stay. A collection of houseboats moored on the Dal Lake, moments from Emperor Akbar's famous Mughal Gardens. Decorated in a traditional style with wood panelling, chandeliers and locally made handwoven rugs. Serving indulgent Kashmiri dishes as well as European there is even a private garden. Sights nearby - One of Srinagar's most aesthetically pleasing structures, the spires of Khanqah Shah-i-Hamadan are worth viewing. 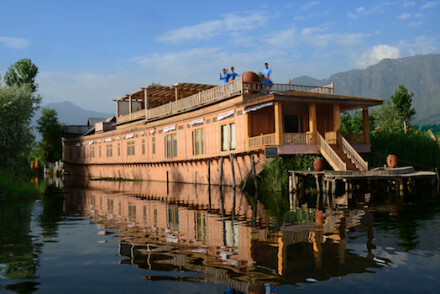 Sailing - Visit the floating villages and gardens of Dal Lake - an entirely different way of life. Great walks - Walking distance from the tranquil Mughal Gardens. 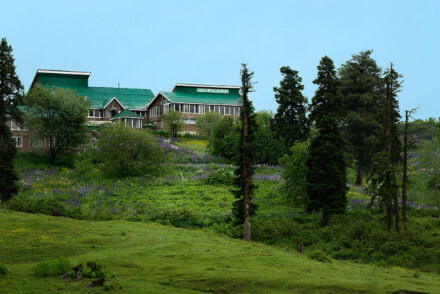 In the loving hands of the family since 1966 this unique property has quaint gardens and stylish interiors in easy reach of Gulmarg's slopes. Rooms are beautifully decorated with graphic prints and antique retro furnishings. Cuisine is continental and Kashmiri - ideal for a day on the slopes. Trekking - If skiing's not your thing then Gulmarg is also a popular trekking destination. Value chic - Much cheaper and more chic than your average ski break. Skiing - Just a short walk from the nearest gondola. Great walks - Perambulate Gulmarg and complete the 'Outer Circle Walk'. Built in 1910, Grand Palace was the former residence of Kashmiri royal family. True to its regal roots rooms are decorated in an opulent, yet not ostentatious style: quilted bedspreads, artwork and some four posters and fireplaces. There's a walnut clad bar and North Indian cuisine at The Chinar. Spa - Provides complete holistic experience: aroma, ayurvedic, herbal & natural therapies, patented colour healing & yoga. Sailing - A private boat trip on the Dal Lake where you can see the floating gardens and villages is an unforgettable day. Birdwatching - Srinagar's lakes are a magnet for migratory birds as well as being home to many native duck species. High up in the Pir Panjal mountain range lies this luxurious retreat. Surpassing expectations it has four restaurants ranging from Kashmiri to Continental, afternoon tea and a cigar lounge. There is a sumptuous indoor pool and spa. Rooms include ornately upholstered furnishings and mountain views. Trekking - In the summer months Gulmarg is a popular destination for trekkers. Skiing - Gulmarg is India's prime skiing destination. Sights nearby - When frozen over Alpather Lake makes for a picturesque ice skating spot. 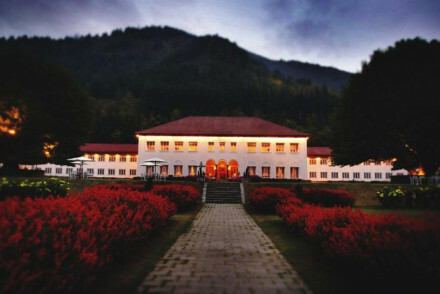 Built in 1820, Stok Palace is still the abode of the remaining Namgyal dynasty. Now open to the public it houses a fascinating museum filled with family heirlooms. Rooms are decorated with authentic Ladakhi furnishings including hand painted mandala paintings. One of a kind. Great walks - There are some beautiful walking routes, across the Indus River, leaving directly from the property. 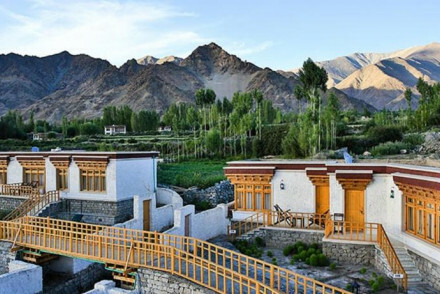 Back to Nature - Surrounded by the Zanskar mountain range this property is ensconced by nature. Cooking classes - See how it is done in the traditional, open plan, Ladakhi kitchen. Hideaway - A historic hideaway with pristine rural surrounds. 1730 feet above Srinigar with far reaching views of the Dal Lake. Possessing all the style & service expected of a Taj: there's a top class spa. Restaurant-wise Latitude makes the most of those vistas whilst Jade Dragon serves Sichuan cuisine. Rooms are luxurious modern meets Mughal. Sights nearby - The Khanqah Shah-i-Hamadan is an architechtural offering to Srinigar's religious culture. Birdwatching - Migratory ducks and Kashmir's famous wild ducks can be spotted. Local markets - The Kashmir Government Arts Emporium is a collector's dream. Great walks - Meander through the rose scented Mughal Gardens. 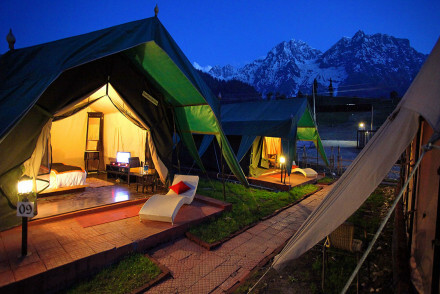 Overlooking snow-capped mountains and Thiksey monastery, The Chamba Camp's tents are superlative. With four poster beds, power showers, bespoke writing desks & private verandahs this is 'glamping' to the nth degree. The food is astounding: haute cuisine in high places. Operational June - September. Back to Nature - Ladakh has some of the most dramatic landscapes in the world. Experience nature in its full force. Restrictions on children - No restrictions on children however the campsite would not be suitable for very young children. Local markets - Leh town with its Tibetan markets are a scenic drive away. Sights nearby - Morning prayers at Thiksey monastry are an absolute must.